To get the maximum publicity it can for the new MINI at the Geneva Motor Show BMW has now announced specifications and names for the new MINIs which will go on sale in the UK on Saturday 7th July 2001. 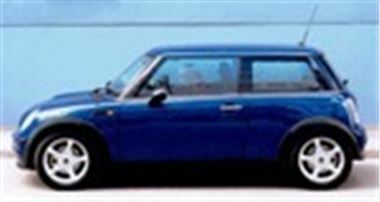 The 90bhp MINI will be called the MINI ONE. Its 1,598cc engine will put out 90bhp at 5,500rpm and 140Nm (101 lb ft) torque at a low 3,000 rpm which should be very useful in town traffic. Its top speed will be 115mph, its 0-60 10.7 seconds and its combined fuel consumption 43.5mpg. ABS will be standard. And the car will ride on steel 15" wheels with 175/65 R15 tyres (the alloys shown are extras). The 115bhp MINI COOPER will develop 116bhp at 6,000 rpm and 149Nm (108 lb ft) torque at 4,500 rpm from its 1,598cc engine. It stop speed will be 125mph, its 0-60 9.0 seconds and its combined fuel consumption 42.2mpg. ABS will be standard as will alloy wheels fitted with 175/65 R15 tyres. Options will include Dynamic Stability Control and Steptronic Automatic Transmission. Dimensions of all MINIs are: length: 3,626mm; width: 1,925mm; height: 1,396mm. Unladen weight will be 1,040 kg DIN for the MINI ONE and 10kg heavier for the MINI COOPER. Boot capacity will be 160 litres and fuel tank capacity 50 litres. Custom packs dubbed Salt, Pepper and Chili will be available. Salt adds front seat parcel nets, extra interior lights, fog lights and a steering column rev counter to the MINI ONEs spec. Pepper adds the Salt items plus chrome bumper inlays to the MINI COOPER spec. While Chili adds fabric and leather sports seats, leather steering wheel, sports suspension, 16" alloy wheels and a roof spoiler to the Pepper items for the COOPER. Though BMW is setting up stand-alone MINI showrooms, the car can be ordered from virtually any BMW dealer and advance orders of 1,500 have already been taken. Eventual production of the Oxford factory is estimated to be 100,000 a year and the UK will take 20,000. As long as an uninterrupted supply of engines can be secured from the Daimler Chrysler engine plant in Brazil, I predict that the MINI will be a runaway success in Europe, sales far exceeding those of other retro cars such as the VW Beetle and Chrysler PT Cruiser. It has enormous appeal. You simply cannot look at one or sit in one without wanting it. I reckon the new MINI is all set to be the sexiest small car you can buy and perfect for town use. Conquest sales are going to come from owners of soft top sports cars, keen drivers and anyone concerned about image.